Shubh Mangal Saavdhan (transl. Beware of marriage) is a 2017 Indian Hindi-language comedy drama film. It is directed by R.S. Prasanna and produced by Aanand L. Rai. It stars Ayushmann Khurrana and Bhumi Pednekar. The movie was released worldwide on 1 September 2017. 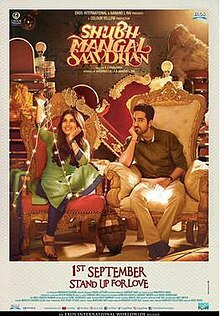 Shubh Mangal Saavdhan is a remake of director's own Tamil film Kalyana Samayal Saadham which was released in 2013. The film received universal critical acclaim and was also a commercial success at the box office. The film got five nominations at the 63rd Filmfare Awards, including Best Actor for Khurrana, Best Actress for Pednekar, and Best Supporting Actress for Seema Pahwa. The story is about Mudit Sharma (Ayushmann Khurrana), a Gurgaon boy with a marketing job, who falls in love with Sugandha Joshi (Bhumi Pednekar). Shy by nature, Mudit tries all possible ways to talk to Sugandha but fails. Finally, he decides to send her an online marriage proposal. When the two finally meet, they feel the sparks and decide to take it to the next level. A formal marriage proposal is exchanged between their families. Incidentally, when Sugandha's parents are out of town, Mudit and Sugandha try getting intimate and when they finally reach the bed, a visibly uncomfortable Mudit declares that he needs to use the washroom. But when he returns, he gets dressed and makes for the main door. When a concerned Sugandha asks him about this sudden change of plans, he simply insinuates at his problem with the help of a biscuit, getting Sugandha to realize that he is facing a bout of erectile dysfunction. Mudit and Sugandha try different ways to solve the problem but fail, and when Mudit comes face to face with the reality of his impending marriage, he decides to cancel it. Now deeply in love, when Sugandha hears him say no to tying the knot, it leads to a heated argument between them. Sugandha leaves saying that she would be waiting for him and his baaraat (wedding procession). Eventually, accompanied by a posse of assorted relatives, Mudit leaves for Haridwar, where the marriage is scheduled to take place. During the journey, Mudit constantly receives calls from someone stating that he is a well-wisher and knows about his problem. When he reaches Haridwar, and the calls continue, Sugandha takes the call, and showers abuses on the unknown person, suddenly realizing, that the well-wisher is none other than Sugandha's father. When Mudit and his future father-in-law consult a veterinarian, the doctor simply tell them that it's all because of stress. A day prior to the wedding, Sugandha and Mudit try getting intimate one more time, egged by relatives from both sides of the family. When they exit the room some time later, they find every family member waiting expectantly about Mudit having done 'it'. Mudit says that he managed to perform but Sugandha refutes his words. The families are now deeply worried. As the hour of the wedding approaches, Mudit understands the true meaning of reaching manhood and risks his life to stand up for the love of his life, Sugandha, and the two are finally married. In the closing narration, Sugandha says that nothing happened on the first night or their honeymoon and then, they simply got busy with their lives. And one fine day, it simply happened, even as the whole family was busy in a pooja (prayer ceremony). The film was extensively shot in Delhi, Rishikesh and Haridwar. Anshul Chauhan was roped in to play the friend of Bhumi Pednekar in the film. The music of the film is composed by Tanishk Bagchi and Vayu and all the lyrics were written by Bagchi and Vayu. The first track of the film "Rocket Saiyyan" sung by Ritu Pathak, Brijesh Shandilya and Bagchi was released on 5 August 2017. The second song "Kanha" sung by Shashaa Tirupati was released on 9 August 2017. The third single to be released was "Laddoo" sung by Mika Singh and it was released on 24 August 2017. The soundtrack consists of 4 songs and was released by Eros Music on 5 September 2017. All lyrics written by Tanishk-Vayu; all music composed by Tanishk Bagchi, Vayu. Rajeev Masand of News18 praised the performances of the leading pair, Ayushmann Khurana & Bhumi Pednekar, and concluded his review by saying that, "Shubh Mangal Saavdhan rises above its minor problems to deliver plenty laughs. It’s one of the year’s most enjoyable films" and gave the film a rating of 3.5 stars out of 5. Neil Soans of The Times of India gave the film a rating of 3.5 stars out of 5 praising the performances of the actors and the humor of the film but found the climax of the movie to be a letdown. Ananya Bhattacharya of India Today praised the movie saying, "This is easily one of the best films that Bollywood has given us in 2017. Shubh Mangal Saavdhan does not fall flat. It flies" and gave the film a rating of 4 stars out of 5. Sweta Kaushal of Hindustan Times gave the film a rating of 2 stars out of 5 saying that, "Prasanna presents Shubh Mangal Saavdhan in a rather flat manner and refuses to give space to characters other than the hero and heroine, leaving behind one mess of what could have been a fun-filled entertainer." Shubhra Gupta of The Indian Express gave the film a rating of 2.5 stars out of 5 saying that, "overall this comedy of middle-class-Dilli-manners-and-mores suffers from a sit-com flatness, and a sagging climax." ^ "Shubh Mangal Saavdhan - Box Office". Box Office India. ^ "Box Office: Worldwide collections and day wise break up of Shubh Mangal Saavdhan". Bollywood Hungama. ^ "Uttar Pradesh becomes the new flavour of Bollywood in 2017". ^ "Shubh Mangal Saavdhan movie review: Bhumi, Ayushmann's film travels from super fun to superficial". ^ "Ayushmann Khurrana, Bhumi begin Shubh Mangal Saavdhan shoot in Delhi". Hindustan Times. 1 March 2017. ^ "Shubh Mangal Saavdhan: Ayushmann Khurrana, Bhumi Pednekar begin shooting in Delhi, see pics". The Indian Express. 1 March 2017. ^ "Ayushmann Khurrana, Bhumi begin Shubh Mangal Saavdhan Trailer released". 1 August 2017. ^ "Shubh Mangal Saavdhan Has Good Hold on Monday". ^ "First look of Ayushmann Khurrana, Bhumi Pednekar starrer Shubh Mangal Savdhan". Bollywood Hungama. Hungama Digital Media Entertainment. 17 January 2017. Retrieved 27 February 2017. ^ "Haridwar and Hrishikesh play pivotal parts in 'Shubh Mangal Saavdhan'". ^ "Bhumi Pednekar, Ayushmann Khurrana are Sweet People: Anshul Chauhan". ^ "Shubh Mangal Saavdhan (Original Motion Picture Soundtrack)". iTunes. ^ "Shubh Mangal Saavdhan Review: One of This Year's Most Enjoyable Films". News18. ^ "Shubh Mangal Saavdhan Movie Review". The Times of India. ^ "Shubh Mangal Saavdhan Movie Review: Ayushmann and Bhumi shine in this joyride". India Today. ^ "Shubh Mangal Saavdhan movie review: The film fails to get it up despite Ayushmann Khuranna's fine act". Hindustan Times. ^ "Shubh Mangal Saavdhan movie review: The Ayushmann Khurrana and Bhumi Pednekar film suffers from a sagging climax". The Indian Express. ^ "Star Screen Awards 2017: Dangal wins big, Vidya Balan-Rajkummar Rao named best actor and actress". Retrieved 31 December 2017. ^ "63rd Jio Filmfare Awards 2018: Complete winners' list - Times of India". The Times of India. Retrieved 21 January 2018. ^ "IIFA Nominations 2018: Tumhari Sulu Leads With 7 Nods, Newton Follows". NDTV.com. Retrieved 28 May 2018. This page was last edited on 10 April 2019, at 13:24 (UTC).